VOLGOGRAD, Russia –- This week, the Jewish community of Volgograd has been busy taking part in the Fourth National Cultural Festival ‘Volgograd’s Mutual Friendship’. The highlight of this event was a gala concert that took place at the city’s Musical Theater. Along with presentations by a number of Jewish performing arts groups, the show also featured lively and touching routines from the other ethnic groups and diasporas represented in Volgograd, as well as ethnic songs and dances performed by local ensembles having a much broader repertoire. On this occasion, the Jewish community of Volgograd was proudly represented by the ‘Levavot Shirim’ Choir, which functions under the auspices of the Ohr Avner Chabad Day School, and the ‘Adar’ Ensemble. Festival organizer Galina Andronova noted her pleasure at witnessing the show put on by these two groups. “They began to fill the concert out really well with their traditions, which underline the uniqueness of each of these groups,” she remarked. Two other solo performers – members of the local Jewish community – also participated in the event on their own merit. Ohr Avner graduate Tamara Abramova thrilled the audience with her heartfelt singing, while Andrei Zuyev performed songs he composed himself, as well as a number of his poems. All artists involved in this grand event received gifts and were awarded diplomas for their participation. 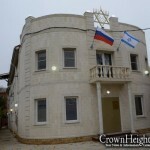 The Jewish community of Volgograd, a member of the Federation of Jewish Communities of Russia, has organized and promoted performance arts groups since its very foundation. Its ensembles regularly partake in public events in the region, helping to encourage greater interest in and mutual understanding about Jewish culture in the region.